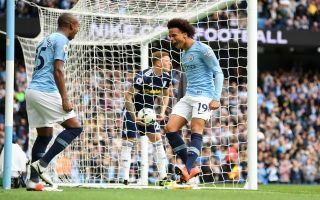 Leroy Sane – who has been subject to criticism from all angles in recent weeks silenced his critics only 2 minutes into Manchester City’s Premier League fixture against Premier League new boys Fulham. Prior to this afternoon’s matchup Sane had been limited to substitute appearances for the defending champions and Pep Guardiola’s decision to award the 22-year-old winger with his first start of the season definitely paid off. Leroy Sane scored after some great work by teammate Fernandinho. The Brazilian picked up a wayward pass by Fulham before bursting forward and teeing up Sane, who comfortably tapped home to give City the lead. Today’s goal will give Sane a huge boost in confidence and the frightening winger will be eager to once again set the Premier League alight with his impressive displays.